This tool is now freeware! Starting from July 2011, we are giving away this utility! You can even set it to show source code for every element under your cursor, allowing you to quickly peak through the source as your cursor moves across the page. Instant Source can show all Flash movies, script files (*.JS, *.VBS), style sheets (*.CSS) and images on a page. You can save all external files into the selected folder with a one click. Why is Internet Explorer's View Source command so inconvenient for viewing HTML? Usually, you want to look at the code of a certain part of the page, not the entire page. The time needed to find the right code block may be significant. You have to select View Source command from the menu and switch to the text editor every time. You can't access external *.css and *.js files. The View Source command displays HTML in the Notepad without any syntax highlighting. The Web Browser (we will talk about Internet Explorer only) does not show the same HTML source as you see! It shows HTML that was loaded from the server without any further processing. However, modern sites extensively use Dynamic HTML for changing the page code after loading. Hence, what-you-see is NOT what-you-get! Instant Source will resolve these problems. 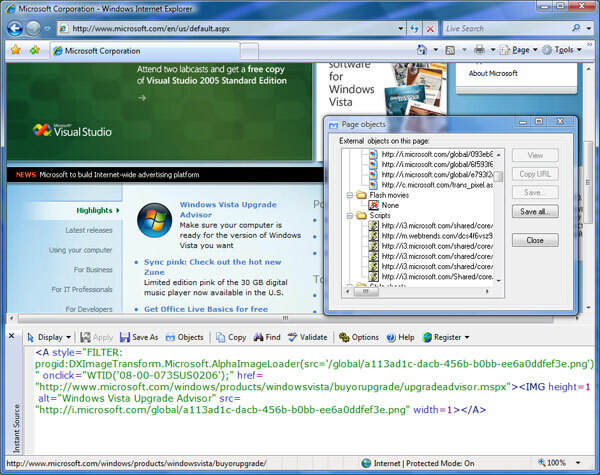 It integrates into Internet Explorer, so you don't need to use an external viewer. You get the HTML of the page element as quickly as possible - just hover the mouse over it, or select it. HTML editing directly inside web browser. Enhanced View Source command replacement. Instant Source can display the HTML code that exactly matches the visible content of the page. It shows all external files on a page and lets you to save them with a one click. Easy real-time viewing of the cascade style sheets (CSS) and script files. Quick access. Click on the button on the Internet Explorer toolbar to invoke Instant Source. Possible with IE8 - if your Internet Explorer crashes on exit, turn off Adobe PDF Link Helper plugin in Tools > Add-ons menu. WebAttack.com reviewer comments: "Excellent tool for web developers - after using this just once, you'll never go back to the traditional View Source function". SoftLandMark.com - 5 stars + editor's pick. Editor's comments: "An excellent, completely useful tool!" WareSeeker.com Editor's peek. 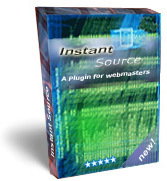 "We’re aware that your product Instant Source is very useful and we will categorize your product as an editor’s pick software on WareSeeker.com"
Kevin Monson, USA: "I have found Instant Source to be very handy. I have been using it every day. Thank you." Diego Narbona, Spain: "Your unique program is just great!" Robert Fisher, Canada: "Thanks! Your tool is really useful and time-saving."